A typical county fair brings hundreds of livestock and other domesticated animals in close proximity of people. These animals are generally healthy but occasionally may be shedding (defecating) disease-causing bacteria. Because zoonotic diseases (e.g. diseases transmitted from animals to people) – like Salmonella and E. coli – are commonly found in the feces of farm animals like cattle, sheep and goats, it’s good to take some common sense precautions to protect yourself and your family. (Excerpted and modified from NASPHV, 2013). Educate: Wherever there is public access to farm animals, information about the risk associated with the transmission of pathogens should be provided to all visitors. This may include signage before entering or video or audio informational pieces. For pre-arranged school visits a mailed informational sheet for parents is a good idea. An effort should be made to ensure that the visitors are aware that animals such as calves, young ruminants (i.e. sheep and goats), young poultry, and ill animals may pose a threat to human health and that appropriate hand washing can minimize that risk. Instruct visitors not to eat, drink, smoke, place hands in mouths or use bottles or pacifiers within animal contact areas. Monitor: Anticipate and observe the type of animal/human interactions such as feeding or petting animals, and appropriately educate visitors about proper hand-washing following animal interactions. Control visitor traffic: Ensure over-crowding is avoided by controlling the number of visitors in animal-contact areas. 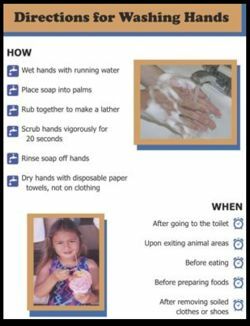 Encourage and supervise hand washing: At each entrance to an animal holding area, visitors should be made aware of the potential risks from animal contact and take measures to reduce that risk. Visitors need to wash or sanitize their hands upon exiting the animal contact area. Hand washing facilities should ideally have running water, be well stocked with soap and paper towels, and accessible to small children. The facilities should be readily visible and able to handle the maximum anticipated attendance. Venue staff should monitor and encourage hand washing. Communal basins are not adequate hand washing facilities (MMWR Weekly, October, 2001). For information on appropriate hand washing, please see the CDC’s page on clean hands. Apply heightened precautions for high-risk groups: Children under age of five years, people with waning or compromised immune systems, and pregnant women are potentially at greater risk for serious infections, and hence should strictly follow the precautions outlined. Frequently disinfect: Clean surfaces – especially floors and railings – at least once daily. Care for and manage animals properly: Animals that are actively shedding (e.g. defecating) human pathogens should not be exhibited in fairs and petting zoos. This is especially important for animals with diarrhea (scours). Remove manure: Sanitary removal of animal manure, followed by sanitation of traffic areas and holding bins is essential to prevent environmental contamination. Control dust: Some bacteria can survive drying. Hence, dust on contaminated surfaces can result in human illness through hand-to-mouth contact or occasionally if dust is stirred up. Adequate ventilation should be provided. Designate contact and eating areas: Farm animal contact areas should be separated from the food service area. Animal petting should be allowed only in the animal interaction area, under close supervision of parents, guardians and the venue operator. Double barriers should be provided to separate contact between animals and their environment and food area (MMWR Weekly, October, 2001). Provide storage or holding areas for strollers and related items: Establish designated areas where parents of young children can leave strollers, diaper bags and other items during visits to animal-contact areas. Strollers should not be allowed in such areas. Even if you do not touch the animals, the environment that the animal lives in can be contaminated by germs. This means that hand washing is still critical when visiting areas where animals reside even if you never touch the animals. This is another reason to not eat when visiting animal contact areas. Eating and food preparation should be done in separate areas, away from animals. Several outbreaks have been linked to children visiting farms. Agents identified in these outbreaks include E. coli O157, Cryptosporidium, Salmonella, and Campylobacter. The risks to visitors and farm families include direct contact with animals shedding potential pathogens, contaminated environment, and consumption of contaminated products. One of the chief areas of concern has been the consumption of raw milk (i.e. unpasteurized milk). Additional information about the risks of raw milk are available at Real Raw Milk Facts. Rare human cases of influenza viruses from swine have been reported. In recent years more cases are being reported likely due to improved diagnostic tests and clinical awareness. The majority of these are associated with swine contact. This includes interaction occupationally with swine on farms or visiting swine at county fairs. A review of cases of swine influenza identified 50 cases worldwide since the late 1960s. Some of these cases are fatal. It has been recommended that swine workers should be vaccinated with the annual seasonal influenza vaccine. In addition, folks who are ill with influenza-like symptoms should refrain from swine contact. This includes visitors to swine exhibitions such as County Fairs. Some guidelines have been recently provided by the Centers for Disease Control and Prevention. 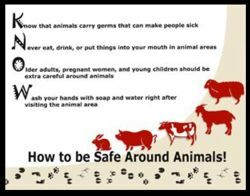 Signs and Posters for hand hygiene and recommended precautions for preventing the spread of pathogens at animal exhibits, from the National Association of Public Health Veterinarians are available online. Also check with your State or Local Health Department. Aedin’s Law: A North Carolina law passed in honor of 2-year-old Aeden Gray of Orlando, Fla., one of 15 children whose exposure to E. coli O157:H7 at the North Carolina State Fair led to Hemolytic Uremic Syndrome and kidney failure.